As the debate about net neutrality is moving forward in the European Parliament we are closely following the proceedings and giving input on all levels along the way. Because of the tight timetable imposed by the European Commission, many of the discussions in the Parliament are happening in ways which make it difficult for parliamentarians, let alone the broader public, to keep track of. For the sake of transparency, and to allow interested parties to keep track, we have published below all our analysis documents regarding the Telecom Single Market Dossier. You can find our amendments to the Commissions proposal here (pdf). Often the discussion revolves about the definition of “specialised services”, which can be treated differently from open internet services. European regulators – the people that have to implement the law and defend competition already produced a strong definition in 2012 “Guidelines for quality of service in the scope of net neutrality” as a basis. We support this definition and oppose political efforts to produce less clear legislation. 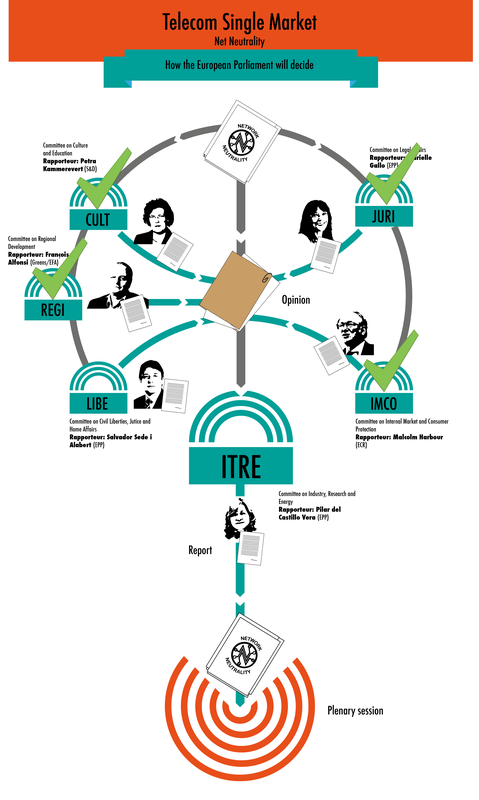 As you can see in the infographic below, there were six committees responsible for this Dossier in the parliament. Four of them (Culture, Legal Affairs, Regional Affairs and Civil Liberties) gave advisory Opinions. The remaining two (Internal Market and Industry) were more important as (in theory) they are guided by the Opinions of the other Committees and submit a final set of amendments for a vote by the full Parliament. Details of how the four Opinion Committees is available here: read our analysis of the outcome. After the lead Committee (ITRE) adopted a negative opinion on net neutrality, the Parliament as a whole overturned this position and adopted text to give clear support for net neutrality. 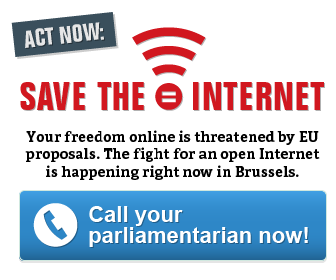 To convince the lead committee to protect the open and competitive internet, we asked people to participate in our SavetheInternet.eu and call MEPs in the ITRE committee. This allowed people, for example to send MEPs a FAX, by just one click! If you are interested in the economic consequences of net neutrality violations or you have a company that’s dependant on the open internet you might want to check out our one pager for SMEs. We prepared three documents, together with other campaign organisations, to provide input in the final stages of drafting in the Council.